When I posted last Sunday about my pink velvet banana (Musa velutina) it had 3 unfurled leaves, and one more almost ready to unfurl. One week later there are four fully unfired leafs and another almost ready to unfurl. That's an incredible growth rate for a plant that has not been in the ground long enough to put out a significant amount of roots! 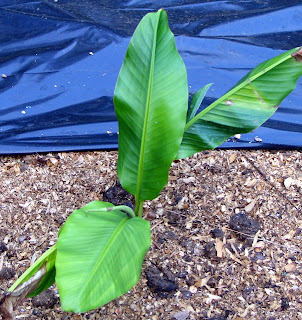 I purchased some PVB seeds and am hoping to get a banana...someday. I didnt know it when I bought them but it can take 3-12 months to germinate. I am hopeful that they will do well once they are "born"